Can you improve balance in bowling? We have a girls college team that holds practice in my local bowling alley. I often see the coaches working with first time bowlers and showing them ways to maintain good balance. Coaches teach them good balance is critical both for accuracy, and repeating the same shot. I thought I could help everyone by gathering information on anything bowlers could do when they ask, can you improve balance in bowling? Let’s find out. If you are like me, you find yourself delivering your bowling shot, and then you kinda take this step to the right. If you do this, you may have your teammates tell you about it. I see it all the time! Bowlers deliver their ball, and then have to step sideways to maintain their balance. This is what is referred to as falling off your shot. Here is a discussion of some problems that cause falling off your shot. Why does that happen? Simple, you didn’t maintain good balance when your arm swing comes forward, you don’t have the proper counterbalance. It could have been several things that caused this. Here is a list of some possibilities that caused it. 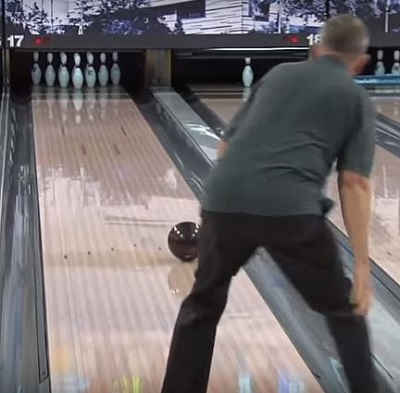 Bad footwork – you didn’t crossover with the slide foot in front of your trailing leg foot.Your slide foot is under your non bowling armpit, instead of under your chin. Fast feet – your feet got to the foul line before your bowling ball, throwing you off balance. Body weight – not balanced over your slide foot. Stand on one foot, put all your weight on your slide foot and don’t let you foot touch the floor to learn what it feels like. Trailing leg is too high and not touching the floor. Power Bowlers seem to have high trailing legs, and their trailing leg feet are in the air. Slower speed bowlers tend to keep their trailing foot on the floor. Body Too Straight no knee flex – you didn’t bend your knees. Putting a slight bend in your knees allows for better balance. If you decide that keeping your balance will make you more accurate, you can begin to work on the reasons why you are falling off your shots. So lets start with bad foot work. When you are taking steps in your approach on the lanes, you need good footwork to maintain your balance. Some bowlers drift one or two boards, some bowlers walk straight. It makes no difference which you do, you just have to do the same thing on each and every shot. You can learn more about footwork in A Good Bowling Arm Swing. You have to place each foot in front the last foot and inline. When you get to your next to last step, it is a must to cross over to clear your hip, and allow the ball to swing past. When you hear someone say, “I hit my Leg” they did not cross over with their foot. The step was a step straight ahead, and that does not allow the hip to turn to lead the way of the trailing leg. If you walk straight for 5 frames and then drift on one shot, you are going to attempt to hit the same mark, but you will certainly get a different axis of rotation. And you may be way off balance as well. The result, you may fall off your shot, and bring your trailing back to catch your balance. If you get to the foul line before your ball you are not going to have the proper leverage to deliver your ball. It is most likely you will miss your mark and throw a bad shot. And it could also cause you to bring you back leg around to catch yourself as well. If you have your foot forward before your arm swing is bringing the ball forward, it makes it hard to create the torque you need to deliver your ball. This may sound a bit odd, stand on one foot. But, honestly it works for me.What exactly does this mean? It means train your body to keep all your body weight on one foot, you slide foot. I keep my foot behind me and balance on my plant foot. This keeps me focused on my balance. You have to bend your knees slightly to help with your balance. The key is you have to remain still and transfer all your weight to your slide leg or plant foot. Once you feel this and teach your body to keep your balance on your slide foot. Then, after practicing it awhile, you can let your foot touch the alley again, or not. Some think it just looks cool. As funny as that sounds, there are many bowlers with their trailing leg in the air. In fact most of the power bowlers and two handed bowlers keep their trailing leg in the air. But, they have learned to balance their body weight on their slide foot. I was told about this stand on one leg technique by a young bowler who averaged about 225 at the time. Since he showed me that, I noticed a few other bowlers who do that as well. Does Walter Ray Williams Jr sound familiar. Watch his style here when he bowls a 279 warming up for match play. Here is another video with Walter Ray giving some tips for timing. Watch his style, he doesn’t put his trailing foot down on the alley at all, he just swings the balance foot behind him and transfers his weight to the sliding foot. As he approaches the foul line, he keeps his head and shoulders relatively still while releasing the ball. He is not pulling his head up, or turning the shoulders as he delivers the ball. Maybe if you try to stand on one leg, you can improve your balance in bowling. Why not give it a try? It may be possible to teach your body to recognize the feeling of all your body weight on one foot, and obtain that comfortable stance of balance. If you like what you read, or disagree, please tell me by leaving a comment below. I answer all my readers promptly. Check Out More Great Bowling Deals and Free Shipping?